After the success of the Like 50 debut last fall, the anticipation of a larger displacement vintage styled option was growing. Welcome the new Like 200i. The perfect combination of classic vintage nostalgia and KYMCO modern technology and reliability is now in a fast, agile mid range displacement scooter. Experience true 2-up performance with a 160cc Electronic Fuel Injected engine. With plenty of underseat storage, along with a color matched top box as standard equipment for groceries and packages, you’ll be able to get your errands done and have fun at the same time! Available in three classic colors: Black, Red and Ivory. The Like 200i uniquely blend agility, performance and economy. Now in two engine choices for cruising around the town or sprinting through city traffic. Check out the line of all new accessories for the Like 200i to personalize your ride just for you. 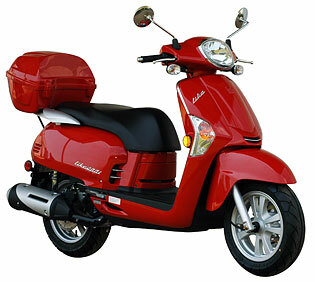 Features Speedometer, Odometer & Fuel Guage and a 2 Year Factory Warranty.